Why gamble with inferior tickets? 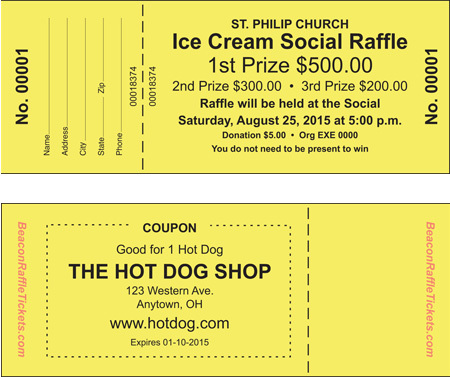 Our Raffle Tickets have the security features that you need. Raffle Tickets are consecutively numbered on 2 ends. Fluorescent security imprint on back. Required! I have reviewed the front of this ticket and certify that it is correct and that I accept the terms and conditions associated with this order as published on this site. By clicking “SUBMIT ORDER” on the payment page I understand that this ticket may by put into immediate production. You will be able to view a copy of your ticket in the "My Account" area after your order has been placed.